Today I have a ‘vintagy’ lamp-post card to share. ‘Vintagy’ because it is a different to my recent ‘vintage watercolour’ cards; it has more colour. My vintage style cards are often brown + black + one more colour but this one still looks a little old despite its red, blue, green and yellow inks. I worked on a hot pressed watercolour paper panel with some masking fluid splattered over it. I stamped the lamp post in black and brown distress inks then blended the colours with a paintbrush on the paper. Before stamping I wiped the ink off the candle inside the lamp so I could use lighter ink later to paint it later. To create the swag decorating lamp I stamped the end of a branch from the woodland beauty set in gathered twigs distress ink. I drew red berries with a barn door distress marker and painted little pine needles in, yes, ‘pine needles’ distress stain then drew the candle in smokey gray and spiced marmalade distress markers. To give the sky some depth I used three blue stains to paint around the lamp, leaving a small snowy hill white at the bottom of the panel. I blended some of the orange from the candle flame with water to fill the lamp and surrounding area. The edges are sponged in ‘vintage photo; and the sentiment stamped in vintage sepia all in keeping with my goal of a vintagy card! It’s winter watercolours on the blog each day this week so I’ll see you tomorrow with some berries. I love the way you did the lamp post and the background just set it off so nicely! Thanks for sharing it with us. I love your watercolor cards, Heather! My Godness… just amazing… just a beauty ! Thank you so much ! Ah, so beautiful! Your colors are amazing, especially the blue background and the light around the lamp. ost. Such a beautiful Christmas card, Heather! Thanks for sharing all the details! 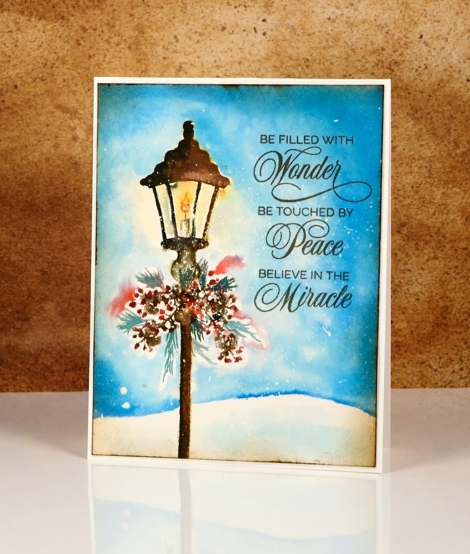 A truly gorgeous vintage card, Heather! Another beautiful card, I live your work.